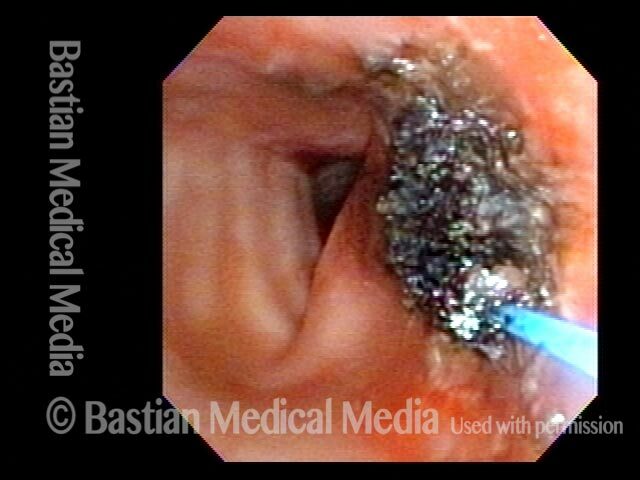 The ultimate surgical option for larynx cancer, in which the entire voice box is removed. Options used to avoid total laryngectomy are endoscopic laser surgery; partial laryngectomy; radiation; and chemo/radiation. 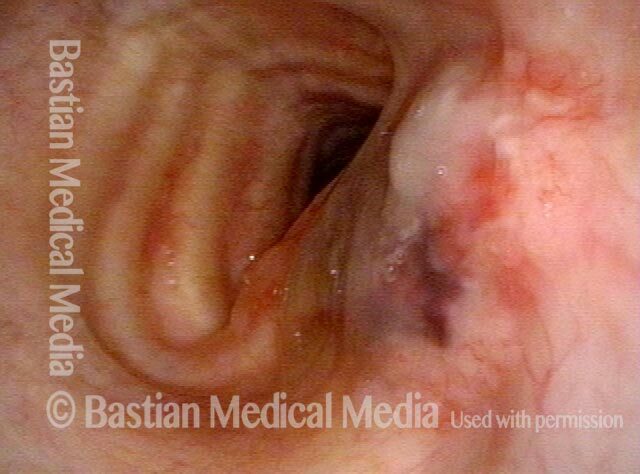 Today, total laryngectomy is most often a salvage procedure, performed after failure of the initial treatment. It is still, however, a good primary option for very advanced tumors not likely to respond to chemo/radiation. Nearly 80-year old man in whom CT for another reason shows this lesion just below the vocal cords, left upper trachea. Comparison with CT 18 months earlier shows the same lesion, and it is now only a few mm larger than then. Note that this man has had partial pharyngectomy and postoperative radiotherapy 40 years earlier for a pharyngeal wall cancer. A week after attempted removal with the laser in the O.R. Removal was only partial due to difficult anatomy. The pathology result was "papilloma, with focus of invasive squamous cancer." Radiotherapy is not an option. Tracheal distortion is from tracheotomy 40 years before. After total laryngectomy, the upper esophageal sphincter is open here for a brief moment, allowing one to see beyond into the esophagus. A moment later, the sphincter contracts, as though the purse string of a velvet jewelry bag had been tightened.